St. Louis is known for many things, including the Arch, thin crust pizza, great baseball, and among other metropolitan niceties, a president. That's right, while the nation's 18th president, Ulysses S. Grant, was born in Ohio, he called St. Louis, Missouri home for a number of years. 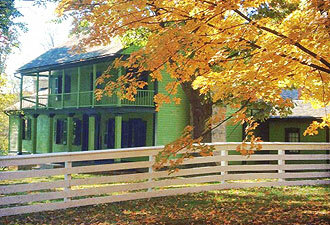 Today, this home is the central part of Ulysses S. Grant National Historic Site, and is referred to as White Haven. It's here that Grant met and fell in love with Julia Dent. After a wedding in 1848 and several years of travel with the military, the Grants made White Haven their home. Start your visit by watching a brief video about the lives of Ulysses, Julia, their family, and the enslaved people who worked the property. 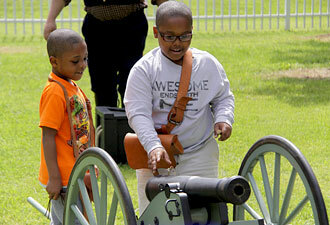 Be sure to allow time to tour the ten-acre site and its historic buildings. Ranger-led house tours are offered every day, sharing intimate details about the rooms where First Lady Grant was raised and, years later, where she and the President played with their own four children. You can rove the largely unfurnished home at your own pace and explore exhibits and panels that chronicle family, separation, political difference, and antebellum culture. 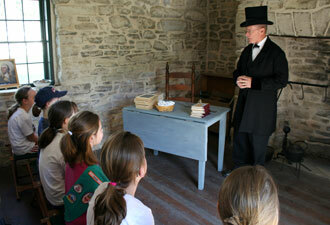 Children can experience the 1840s era by playing period games in the sitting room. Slavery was a reality at White Haven, as is evident when one examines the work spaces behind the home where enslaved workers spent much of their time. Visitors can tour these places and read historical accounts about labor, longing for freedom, and acts of humanity performed despite these workers' status as property. Archeological investigations conducted across the property have uncovered a wealth of artifacts, most from the backside of the house. These discoveries have been paramount to the continuing understanding of this story. White Haven has a thriving Junior Ranger program and an archeology station, a simulated dig site where children learn about the importance of archeology and respect for history. The station encourages children to imagine, judge, journal, and best of all, dig through time. Once a house visit is wrapped up, visitors are off to the museum in the historic stable. Grant's dream was to retire to White Haven and start a horse breeding farm. Today, it houses a top tier museum that illustrates the public and personal lives of the Grant family, a vastly changing St. Louis, the Civil War, the Grant administration, and even a monumental world tour. No matter what time of year you choose to come, you'll find plenty to see and do. Check the calendar for free living history performances, upcoming author visits, children's programs, and honorary celebrations for Ulysses and Julia Grant. We look forward to seeing you soon.